Our family has a tradition of celebrating the change of each season with a special tea. Elizabeth really gets excited about these and even counts down the days! She was so happy when I told her she could pick out our special dessert for our Springtime tea and she chose these Chocolate Bird Nests. 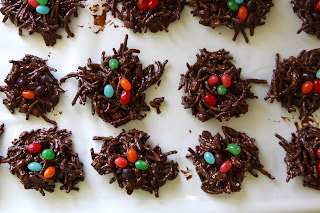 They were very simple to make and she LOVED being so involved with all the ingredients. Her favorite part? Licking the bowl, of course!!!! Love it! That smile wins! Elizabeth's beautiful smile says it all! What a fun tradition. Licking the bowl is the best part of creating in the kitchen. Love the picture of Elizabeth! How did our girls get so big?! Those are so cute and it looks like they're pretty yummy too. BTW, she's getting so big. 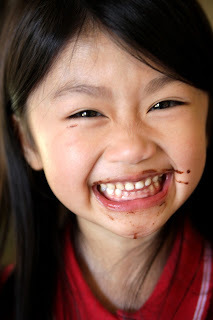 What a sweet chocolaty smile!